Fundamentals of Real Estate Appraisal is a classic text in the field, first published in 1975 and still updated by the original authors. The latest edition of this best-selling text provides a strong foundation for understanding the modern real estate appraisal market. New discussion includes updated Appraiser Qualifications Board Licensing and Certification requirements, building codes, housing styles, orientation, historic district designations, valuation advisories issued by the Appraisal Practices Board, internet resources, cost data, and interest rates. 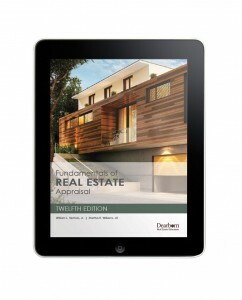 This edition includes learning objectives, and chapter review questions. Additionally, this text covers the basic principles and procedures requirements of the Appraiser Qualifications Board.